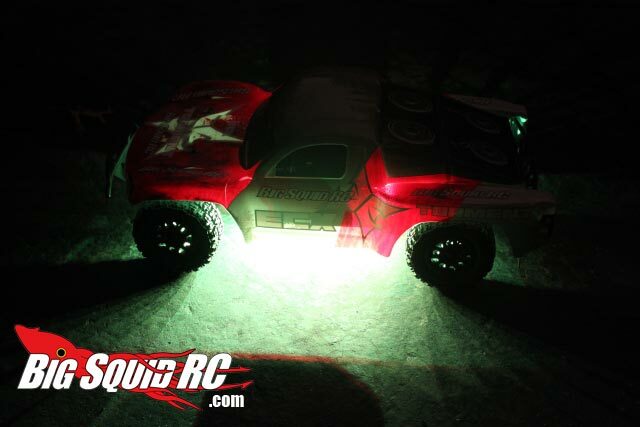 Sunshine Systems RC LED Ground Effects Kit Review « Big Squid RC – RC Car and Truck News, Reviews, Videos, and More! So… I’m up on the drivers stand at iHobby and “Top Jimmy” Swift was standing next to me. I notice Jim’s Slash pulling over to the side of the track and he then proceeds to pull a wireless remote out of his pocket and turns on a set of very bright lights he had mounted under his truck. Jim then proceeds to use the remote to cycles through different colors and “effects”, finally settling on a shade of purple with a strobe effect. I stood there in awe. “You have GOT to be kidding me!” was running through my thick Cro-Magnon skull, it was simply too cool to be believed. Fast forward to 2 days later when Brian walks over and says “Cubby, I’ve got a set of lights for review, do you want’em?”. I never volunteer for any extra work but this time I piped up and said “Heck yes I want’em! Consider the review done!”. What Is It? 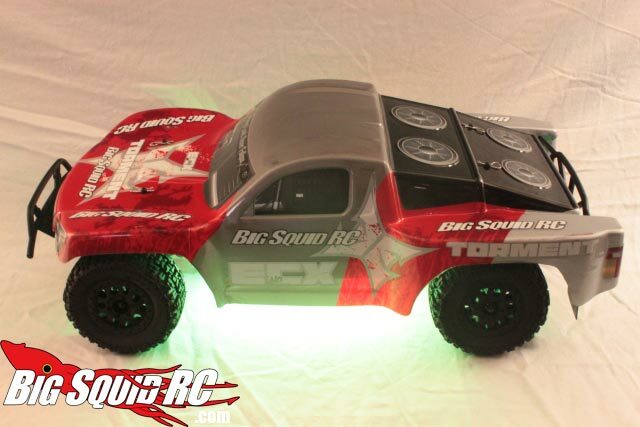 : The Sunshine Systems Ground Effects Kit is two strips of high intensity LED lights that “peel and stick” mount to your rc car/truck. The system is both water and shock proof. Each system does 16 different colors with multiple different effects like “strobe” and “fade”. The kit comes with a wireless remote to adjust the light system from a distance (like a drivers stand). The system easily plugs directly into your cars receiver. What’s In The Box: Everything you need except- zip ties (for securing extra wires). 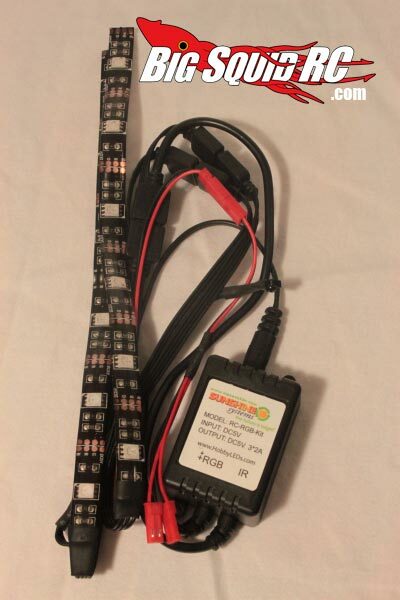 It comes with two strips of lights (that already have adhesive applied), all the wiring you’ll need (that already has connectors applied), a brain module (that comes with velcro already applied), instructions, and a remote control (that already has a battery and velcro installed). Installation: During the iHobby show I watched Adam “The Intern” Beiber, Evan, and Top Jimmy install numerous kits on their show cars, seemingly in a matter of moments. With my review set I set a stopwatch then dug in to see how long it really took to install a complete set. 15 minutes later I was completely finished. I experienced zero install issues, and that 15 minutes included taking multiple pics along the way. So what does a typical install consist of? 1. Peel and sticking down the two light strips. 2. Peel and stick down the RGB controller. 3. Insert power wire into your receiver. 4. Tidy up the extra wires. 5. Have fun! Seriously, anyone, and I mean anyone, can easily install one of these systems. Issues: I hate doing reviews where there is nothing to complain about. So here’s my best effort to complain about the Sunshine LED system. 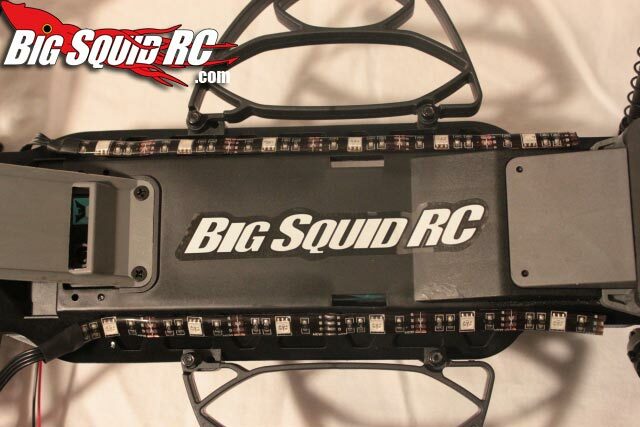 We had several different members of the BSRC Bash Crew install several of these sets and nobody had any issues. Installation went well for everyone on every type of vehicle they tried. We were hucking our trucks all over the place and didn’t have any issues with the system not working or breaking. None of the systems caused any radio reception issues in our trucks. Even the range of the remote was greater than expected (we were getting 40 feet’ish). So… if I had to nitpick- I’d like to have seen some zip-ties included with the kit to aid in securing some of the loose wires (but if you are a true hobbyist, you’ll already have these in your pit box). 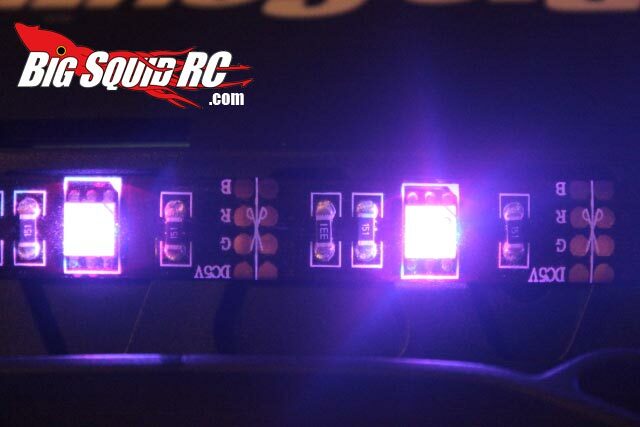 Also, the “brain” RGB module might be a tad large for some installs- like in 10th scale buggies like the B4.1 and Losi 22, and also smaller scale installs like an RC18, Losi Mini-T, etc. The Sunshine system is V E R Y bright, the brightest I’ve seen from a light kit. The lights are bright enough to easily be seen during the day and are extremely bright in darkness. The wireless remote comes with velcro on the back to attach to your transmitter. And yes, it is insanely fun to whip it out on the drivers stand and start changing colors or effects. The people that own Sunshine Systems are based out of Chicago Illinois, you aren’t shipping your money straight to China when you buy these. 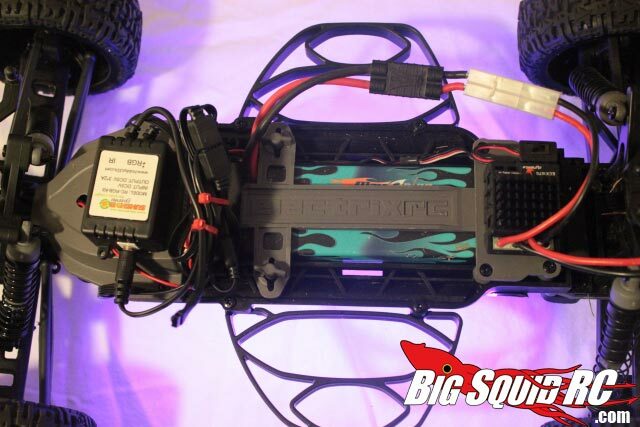 Time To Bash – 9.0/10 -15 minutes, that’s pretty quick for anything involved in our hobby. 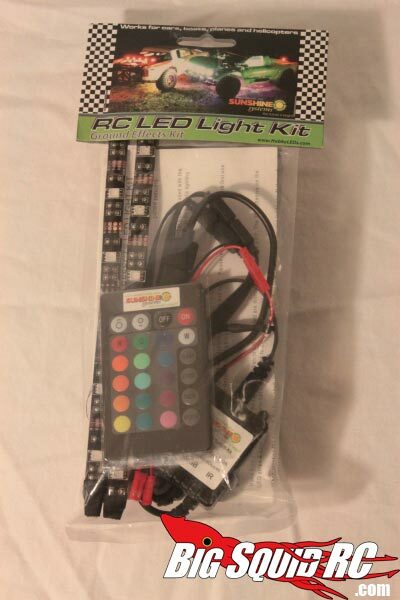 Car Show Rating – 9.5/10 – An LED light kit is made strictly for bling and this set is the brightest and most colorful I’ve seen. Top notch. Bash-A-Bility – 10.0/10 – Our entire bash crew thrashed these lights by crashing them into pretty much every solid object we could find. They were also subjected to severe g-forces when landing from huge jumps. Even after thrashing close to a dozen sets of these we’ve yet to have one break or fail in any way. Fun Factor – 9.0/10 – A light kit won’t make your truck any faster, or lighter, or perform any better, but it sure can be fun. 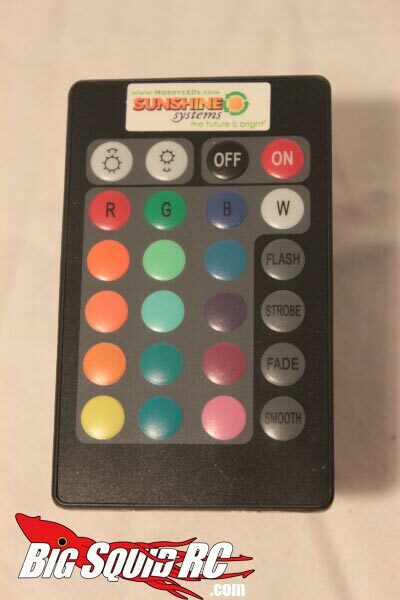 A normal light kit is cool, but the multiple colors, light effects, and wireless remote make the Sunshine Systems kit a ton of fun to use. Power- 9.5/10 – Hands down the brightest light kit I’ve seen in person. I had one industry guru tell me they were “too bright”, although IMO that is impossible. Value- 9.0/10 – The Sunshine system is brighter than its competition, has more colors, has more effects, is easier to install, comes with a remote, and costs about half as its competition, that’s an outstanding value. 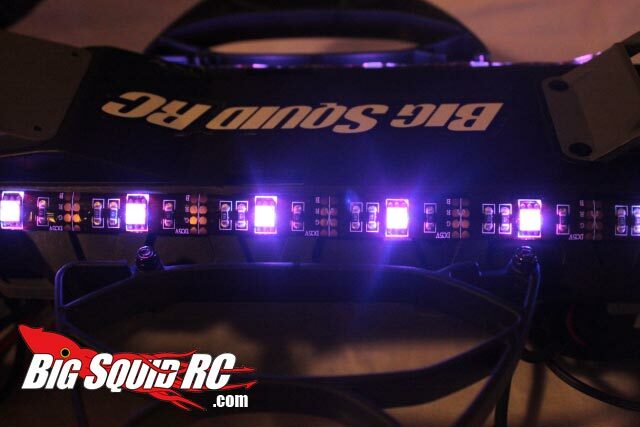 Big Squid Rating – 9.3/10 – Tentacles.. Arguably the best item I’ve ever reviewed for BigSquid, the Sunshine Systems LED kit is outstanding and a must own for those looking to put some bling on their ride. Heck, even if you aren’t looking for bling give one a try, it’s that much fun to use.